← Wilson Perumal’s operating model? I came across the following article on a site called “Community” run by a consulting company called Dynalucid. It uses the business model canvas as a starting point for creating an operating model canvas for a function like IT. 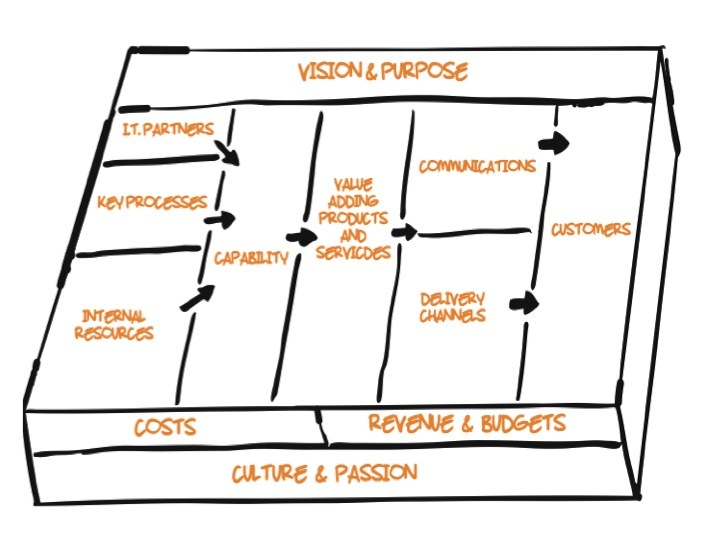 My version of an operating model canvas focuses just on the back end of the business model canvas. But, as I reflected on this article, I realised that, when we do an operating model for a function, we need to think about the whole business model of the function. Thank you to jordan.willms@gmail.com for alerting me to this article, and apologies to Dynalucid for copying it. “An IT Operating Model can be defined as “the rationale of how the IT function harnesses processes, people, partners and assets in order to build a capability and culture that can create, communicate and deliver value to meet the needs of employees, partners and customers”. The Operating Model and its capability is a system with every element impacting the other and therefore only truly makes sense as a whole. Visualisation enables simplification of the complexity. This opens up new insights, shared understanding and robust agreed design decisions that can be taken forward into transition and transformation. The Operating Model Canvas is the Dynalucid operating model visualisation tool that enables Clients to describe, define, design, iterate and innovate around their current and future IT Operating Models. Across the top of the Canvas, we set out the purpose and vision for the Operating Model. This is the overarching ‘due north’ which informs the selection and configuration of all the other Operating Model elements. The right hand side of the Canvas is focused on customers and the value proposition to them. This is where insight, understanding and empathy with our customers (both internal and external) is investigated to understand existing communications, channels and relationships. it is then possible to add the value adding products and services required to meet the specific needs of each segment. As a result of delivering value, budget or revenue streams are returned which are also captured on the right hand side of the model. On the left hand side of the Canvas is set out the capability required to create the specified value. Explored in more detail, one can see that capability is like an eco system made up of many interconnected elements such as roles, data, people and skills. The three macro elements that make up capability are the internal function resources and assets, the key processes and IT partners. All this capability requires investment, and the left hand side of the model is where major cost elements such are salaries and 3rd party contracts aree captured. A couple of comments. Putting “capabilities” in as a requirement before “value adding products and services” is attractive …. but, it raises all the issues I have with using capabilities and capability maps as a tool. I prefer putting “processes” here …. what are the processes needed to deliver the “value adding products and services”. Then the boxes supporting processes will be a range of things: the ILOS of my PILOS model. I like “Vision and Purpose” as an addition as well as “Culture and Passion” as a foundation thought. I also like the 3D design – treating costs and revenues as elements that run through the whole. Of course, most internal functions do not have revenues, so maybe it should be “costs” and “KPIs” or just KPIs, if cost is one KPI! This entry was posted in OM frameworks, Operating Model Canvas and tagged capabilities, design thinking, KPIs, Operating Model Canvas, PILOS. Bookmark the permalink. An interesting perspective. I am rather intrigued at the naming of the operating model as IT operating model – that would normally convey to me – the way in which the IT function operates rather than the way in which the entire enterprise operates. My own view of operating model is that it is reflected through a capability model – the central element in this “other” operating model canvas. Looking at the model, one wonders why it is called an IT operating model, and not a process operating model or a resources operating model? It seems to give primacy to one particular resource class over others, when the reality is that it will not work without the appropriate combination of resource classes – and in a physical operation, unavoidably requires people and physical assets which do not spring to mind when speaking of an “IT” operating model! Nevertheless, an interesting model to contemplate, leaving aside its apparent (to me) misnaming! I am John Reynolds the creator of the model and I have not problem at all with you using it. I created to try and help CIO’s think broadly when designing their organisations as I often saw the beginning and end of the excercisw to be an org chart. I did think about using the term ‘revenue’ and decided that’s whilst CIO’s don’t have revenue as such they very often have internal cross charging arrangements that have to cover their operating costs. Would be good to know how you are getting on with your book.